McDonald hazelnut is a vigorous hybrid variety hazel. It was selected due to its excellent flavor and texture along with its high level of resistance to eastern filbert blight. Nuts ripen early with this selection. 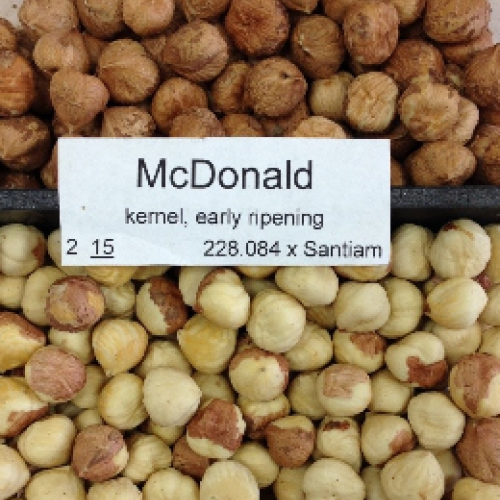 The smaller nuts compared to Barcelona are considered the highest in kernel to shell ratio. 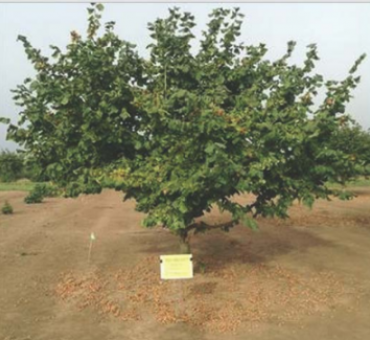 The trees vigor along with its growth habit make it an ideal home orchard selection. Trees remain mostly free of eastern filbert blight with only small cankers forming even under high disease pressure. Our plants are grown from cuttings, then transplantted for 2-3 years old in the field. Developed by Oregon State University. No shipment to OR, WA. Slightly acidic. Not for wet conditions. This variety is easy to grow and fruit in only 2-3 years from planting.